Gen Ken Montgomery, a New York-based Visual Artist and Sound Composer is absolutely genuine; he has no training in traditional music or art. He was never a follower of any direction or school. Instead he founded his own school of off-beat DIY-electronics, driven by irresistible curiosity and ingenuous enthusiasm for sound experimentation and process-oriented performance. His music is dense and full of polyrhythms and counter harmonies with singular control over layers of randomly pulsing, bleeping synthesizers and drum boxes. As a composer in the early eighties Ken was creating multi-channel sound works often performed in total darkness. He began his sound explorations with electronic toys, cheap synthesizers and household gadgetry for which he had a special fascination. His ever present objects of affection are electric machines including an ice crusher (ICEBREAKER), aquarium pump, refrigerator, shoe shine machine, hand massager and a laminator (The Sound of Lamination). Gen Ken & Equipment was self-produced in an edition of 150 tapes in 1981 and led Montgomery to corresponding and trading tapes in the international Cassette Culture and Mail Art network, leading to relationships and collaborations with such luminaries in the underground music scene as Conrad Schnitzler, Giancarlo Tonuitti, CHOP SHOP, David Lee Myers (Arcane Device), Al Margolis, John Hudak, Francisco Lopez, AMK, Istvan Kantor (Monty Cantsin), G.X. Jupiter-Larsen (The Haters), Rod Summers (VEC), Maurizio Bianchi, Masami Akita alias Merzbow, CM von Hausswolff and Leif Elggren among others. Montgomery used the earliest Casio keyboards, self made electronic gadgets, cheap drum boxes and his favorite instrument, the Korg MS-20 synthesizer. The mixture of noise/pop/rock/electronic and soundscapes all on one cassette show how musical genres hadn’t become entrenched in the Cassette Culture scene yet. “Do it!”, “Small World” and “Treat The Hell Out of It” (released as a flexi-disc included with Onslaught Magazine (Artwerk) in 1982 are examples of the songs he composed at this time. In the early 80s in New York City there were still small record shops such as Venus Records, Bleecker Bob’s, Soho Music Gallery and 99 Records that sold artist produced cassettes and fanzines. Independent mail order distributors like Rough Trade and Aeon Records carried Montgomery’s cassettes and On-Slaught Magazine, Option Magazine, Factsheet Five and other small DIY zines listed them or reviewed them. 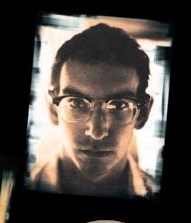 Montgomery’s interest in structured improvisation and avante-garde theater theatre led to the formation of KMZ with his friend Michael Zodorozny from Crash Course in Science. KMZ performed regularly at the legendary Pyramid-Club in NYC. Tracks from KMZ and collaborations with other artists such as Stephen Spera and Stefan Tischler of Port Said can be found on his 2nd tape Collaborations. Between 1982 and 85 Montgomery spent time in Berlin combining performance art and electronic music where he had the fortune to meet and develop a relationship with Conrad Schnitzler who has had a major impact on his life and work. His third official Tape Kalkreuth Keks was recorded in Conrad Schnitzler’s studio during a 2-week stint in the dead of winter 1986. These 8-track recordings incorporated the violin, guitar, and keyboards with analog synthesizers, processing, voice and the “new” sounds of the Yamaha CX5M music computer. Three of the tracks on Postcards are from these sessions. A 4th cassette Beatmusik, released on Al Margolis Sound-of-Pig-Label (SOP186) in 1988 featured a selection of tracks recorded between 1981 and 86. In 1989 Lord Litter from Berlin also released a fifth Gen Ken-tape called Room To Roam, also with recordings from 1984. In 1987 Montgomery, along with David Prescott and Conrad Schnitzler started the label Generations Unlimited. Two cassettes of cassettes of minimal electronic music, Stepping Through Rooms and The One Sided Triangle were released on Generations Unlimited and in1988, GENCON, a collaboration with Conrad Schnitzler was released on vinyl. His involvement in the late 70’s and 80’s Cassette-Culture and the Mail-Art movements led to his creation of the first and arguably still the most important Sound Art gallery in New York City in 1989: Generator. Located in the East Village, then in Chelsea, Generator’s wide scope and novel approach toward audio art made it a vector-point for some of the most interesting and important artists from around the world. Gen Ken also founded A.T.M.O.T.W.— Art is Throwing Money Out The Window — and Generator Sound Art Inc., and he co-founded the seminal experimental label Pogus Productions. The past three decades many of Montgomery’s cassettes, records and CDs have been released in limited editions on small labels outside of mainstream distribution on such respected labels as De Fabriek (Holland), Staalplaat (Holland), Tellus, Mark Lane’s Artwerk, Banned Productions, XI Records (all USA), Firework Edition (Sweden), Old Europa Café (Italy) and Discos Esplendor Geometrico (Spain). Other recorded works are available on his own A.T.M.O.T.W. label, Generator Sound Art and on Touch Radio. Montgomery continues to produce music and soundworks while also producing visual art, collage, bookmaking, and international correspondence art. As The Minister of Lamination (a.k.a. Egnekn) he is the world’s foremost practitioner of sonic Lamination Art and he continues to mail postcards to friends and collaborators throughout the world.